Went to an awesome estate sale last week and found some great stuff! I won’t even tease you by telling you how LITTLE I paid for all of this!! But I WILL tell you about the great folks that put on the estate sale; Kathy’s Estate and Moving Sales. Truly the nicest estate sale people you will EVER meet, and they have VERY reasonable prices. Sign up for their email list to receive email notification with PICTURES of each of their sales. If you are extremely ‘bargain minded’ as I am, be sure to go on the LAST DAY of the sale when all items priced under $50.00 are 50% off! I can never resist a cute little vanity chair! Be sure to check UNDER the seat to see if it has screws for easy removal and recovering. 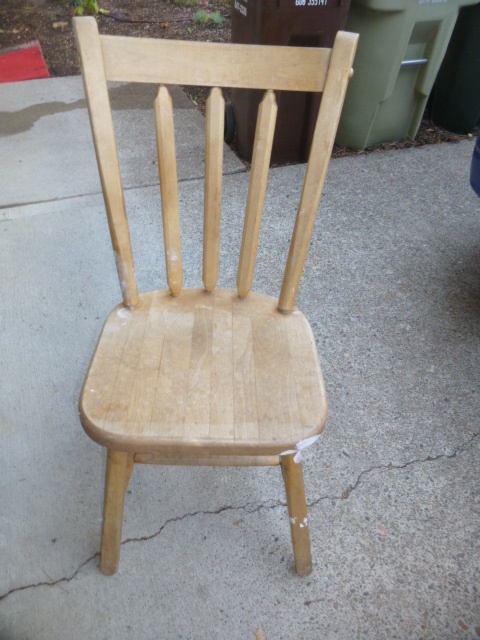 That little wood stool might end up getting paired with the big cutting board to create a little side table. I never pass up little wood step stools! I have NO idea what I’m going to do with those two tall white floral arrangement stands, but they were too fabulous to leave behind! That sweet little picnic basket came with a ‘pie shelf’. It’s pretty rare to find them with their original pie shelf, which is super handy for not squashing your picnic food! OOPS!! I forgot to take the stuff that I had them pack inside the picnic basket out for the picture. 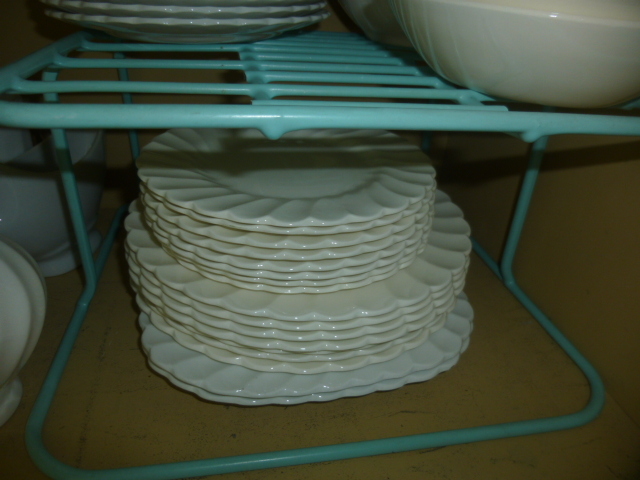 It was some vintage milk glass dishes. 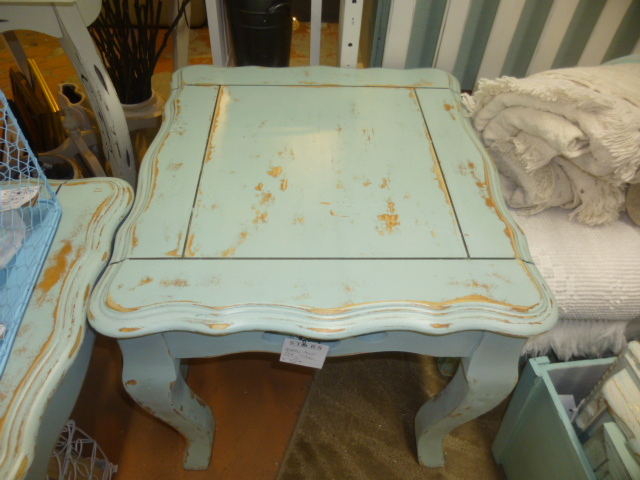 Some other recent finds: cute oval night stand, pair of kid’s chairs (another things I never pass up!) a basic and boring end table, a big sturdy bar stool and a solid oak cubby shelf with scalloped detail. Set of three wood nesting tables, funky old spice rack, little (jewelry box size) chest of drawers, shelf/hutch with heart cut out (which will be done away with!) and wood crate with metal reinforced edges. Yes, I have been on a bit of a furniture buying spree. Reason being that all of a sudden in the last two months I’ve sold a LOT of furniture from my booth at Stars, and I depleted my ‘back stock’ of replacement pieces when I restocked my booth. NOW I just need a few ‘not so durn HOT’ weather days so I can get outside and paint, paint . . .PAINT!! Oh my! Just got another email from Kathy’s Estate sales and it looks like another great sale that I might HAVE to hit tomorrow!! “Happily Ever After” ~ New wall space display. Sorry that it has taken me so long to get the new booth display posted. Been dealing with a LOT of things all at once. Finally feeling settled enough to get caught up on my blog. The theme for May is “Happily Ever After”. Wedding decor. Mostly whites with touches of gold, silver, pale pink and blue. 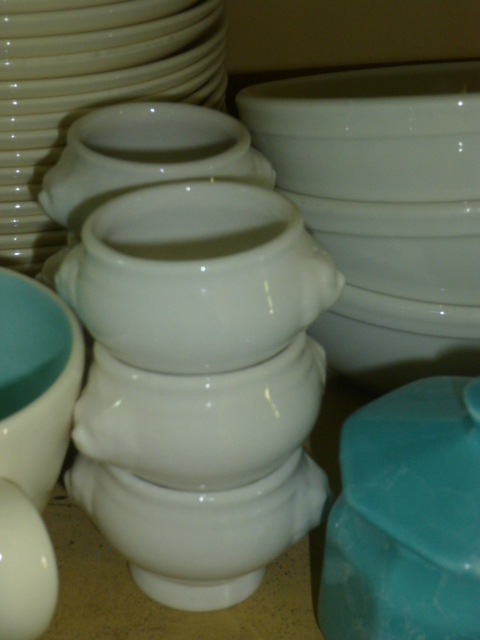 LOTS of vintage milk glass. Here are some of the major elements that might be a little hard to see once they are filled with displayed smalls. 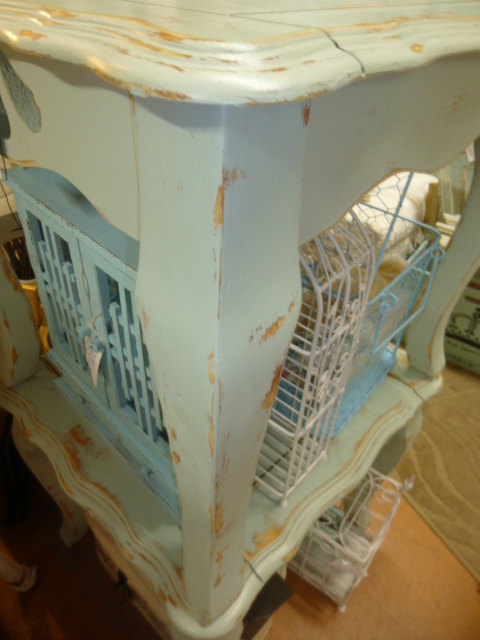 Lots of shabby white tables and shelves. Some of the hand crafted elements. ‘Happily Ever After’ banners made using vintage sheet music and book pages. Bride to be crowns. Vintage paper feathers. Hand stitched vintage lace and felt hearts. Vintage shabby white candelabras and metal filigree lanterns. 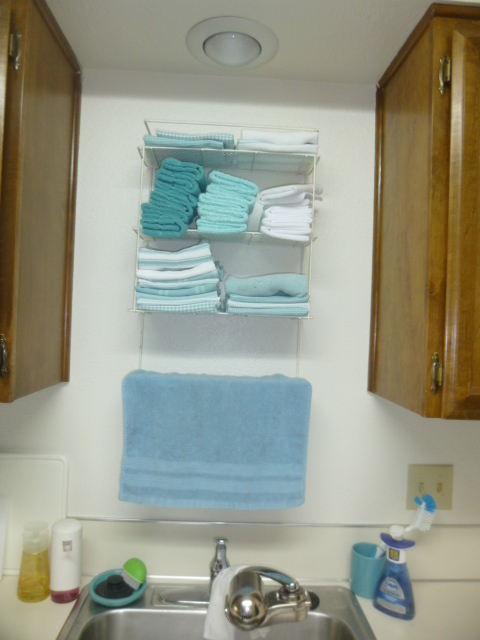 Most of the small shelves can be wall hung OR set on a flat surface. 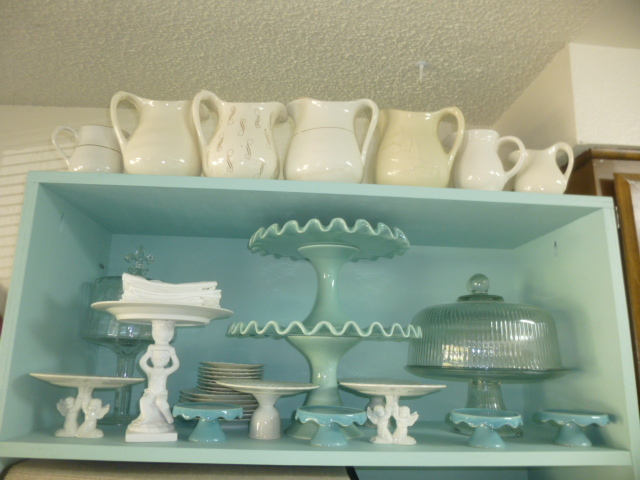 I couldn’t fit ALL the milk glass and cake stands in the wall booth. Lots more to explore in my bigger booth. As always, aqua and turquoise. Vintage chenille spread and coverlet. Little aqua stuffed hearts made from vintage chenille cutter spread. Trugs with vintage wood legs as handles, and pretty dessert stands. Front view of my big booth. As much of what was leftover from last months booth display as I could fit, has been moved over to my bit booth. Bird nests, jars of eggs and moss, jars of natural elements, bark, moss, dried flowers and pods. Some of the burlap items. And lots of the assorted galvanized stuff. 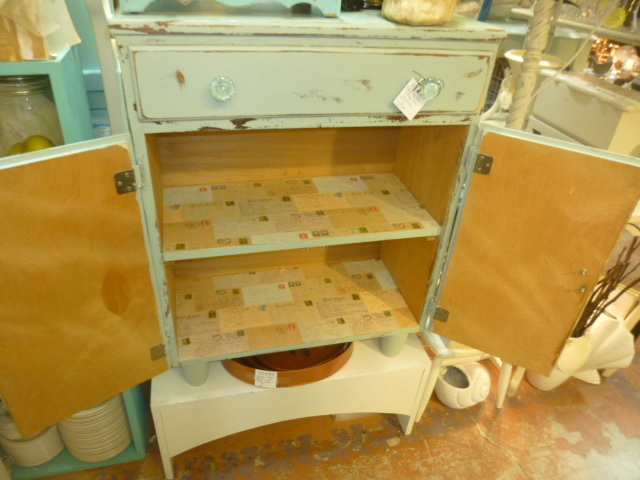 Including that cute 12 hole cubby shelf!! 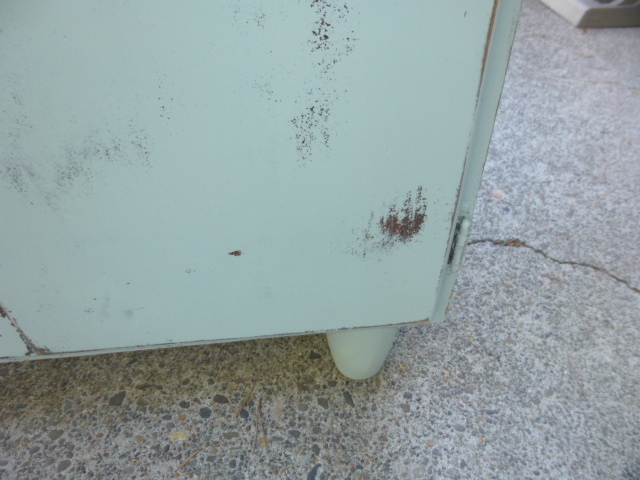 This tall end table / lamp table with one little drawer was in pretty good condition, except for the badly damaged top. A couple of VERY deep cigarette burns and several areas where the embossed gold design had worn down completely. 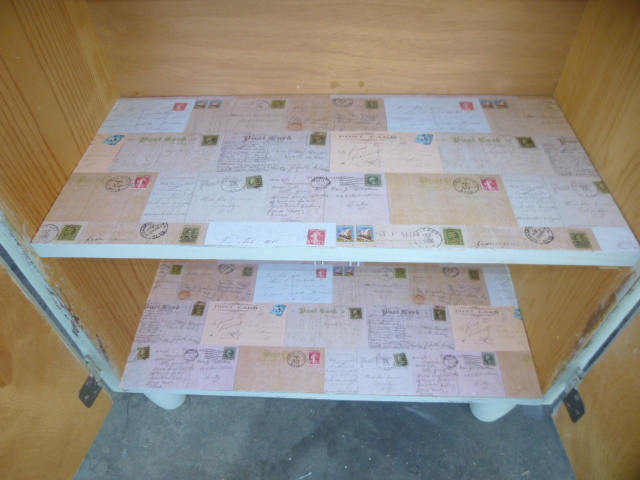 But it was plenty sturdy, had a lower shelf and a drawer (storage is always a big plus!) and it had ‘nice legs’! I decided to buy it and see what I could to with it. The CLEANEST vintage drawer innards I have ever seen! Missing knob is no biggie since I usually change them anyhow. The cigarette burns were not just ‘singes’ . . . they were divots, burned clear through that top layer of wood; and just sanding them was not going to do the job. I filled them with some wood putty, then sanded smooth once the putty was nice and dry. The gold embossed border which was worn away in some spots was very inconsistent. At first I thought I could just sand the rest away. But it was very deeply embedded in some spots and just barely on the surface of others. So I just sanded enough to remove the surface sheen and painted as I usually do. 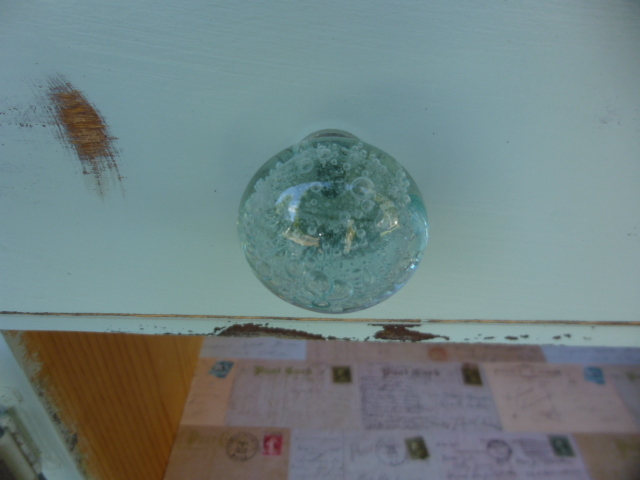 That little drawer was perfect for another one of the aqua ceramic knobs I have. I went fairly light on the distressing because of the issues with the top. All in all, I an quite content with how it turned out. Available for purchase in my booth at Stars for $79.00. I showed you this third oval table in the last post about the nesting tables. Here’s the ‘how I did it’. I’ve had this old pedestal sitting around for quite some time; pondering what to do with it. This oval piece of wood was in a batch of stuff that was left behind at Michael’s house when I moved last summer; that I recently picked up. 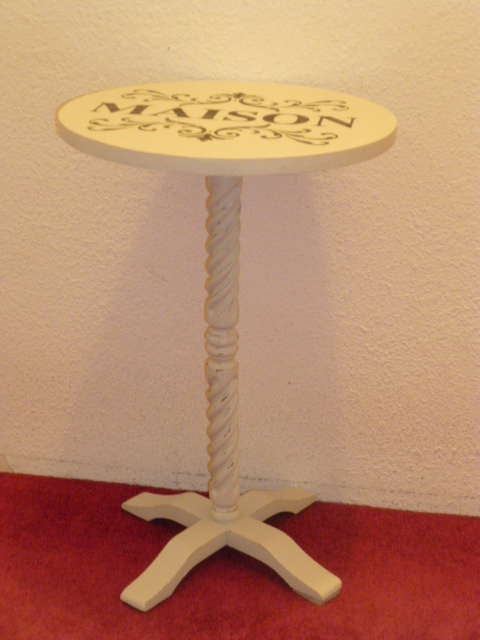 It was the perfect size to use as a table top for the pedestal. Since the pedestal was a dark brown, I did a dark brown base coat on the oval. Two coats of aqua and lots of sanding. I wanted his one SUPER distressed. I painted the base aqua and distresses it to bring out all the pretty detail. Once both were painted, it was time to put the two together. And here is the finished table in my booth at Stars. 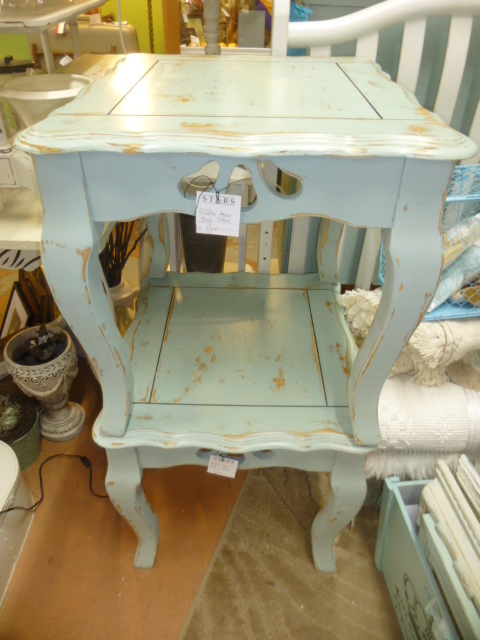 I especially like that it is MUCH more distressed than the other two. This is the current front view of my booth; the trio of tables is right behind this stuff. Bought this set of wood nesting tables at an estate sale a while back. At first I didn’t think they all actually went together, because of the different shapes; but they are indeed a ‘set’. When the smaller tables are ‘nested’ they slide on runners that actually lift the legs slightly off the floor. A unique feature. A set of ANYthing that a customer MIGHT want to buy ‘just one of’; it’s always best to price individually. For several reasons: a) Someone WILL ask “How much for just one of them?” whether they are actually interested in buying just one of not. b) They can STILL buy the set for the combined price; but the store doesn’t have to waste time calling you to ask. c) If the set gets ‘separated’ by shoppers in your booth you have items that don’t have tags and they end up in another booth! It’s just easier to price them individually and be done with it! I didn’t want to completely cover the tables with a design, and I didn’t have any stencils that ‘worked’ with both shapes. Settled on these simple edge designs. 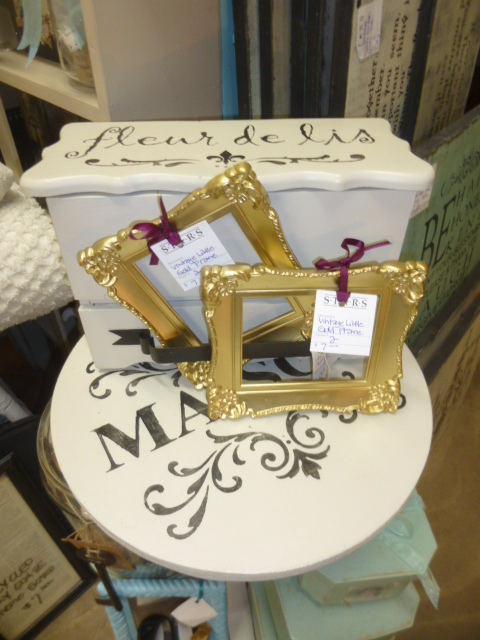 Nesting tables are GREAT to work with in your displays! You can ‘nest’ them id space is tight. Stack and use them like a shelf, or spread them around. I actually only had room for the large oval one when I took then in last week. Stacked it atop a little night stand at the front of my booth. In the meantime, I got this other oval table put together and painted, and took it in along with the two smaller nesting tables on my next trip. 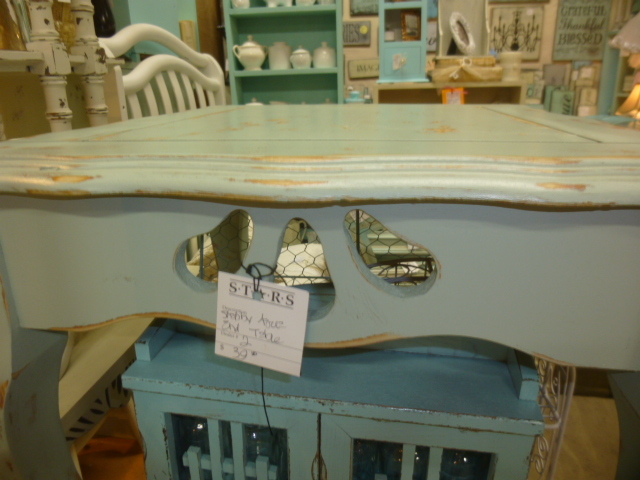 This third oval table has been in my booth for a while. I was HOPING the newer oval pedestal table was a slightly lower height than the one already in my booth; and I knew the oval from the nesting set was shorter. I putting them at the front of my booth, cascading from taller to shortest; with the matching upholstered chair and overstuffed foot stool sitting on top of them; along with some stacks of my grubby books. Yippee Skippee!!! The heights are just right! Alas, the chair legs were a tad too wide to fit on the biggest table. (well, the just perfectly fit . . . but could have easily been knocked off with the slightest touch. A gamble I was not willing to take. So the three tables ended up like this. You can still see part of them from the front of my booth; tucked behind a couple of night stands. As soon as something sells and I have a little more room to work with; I’ll bring the three tabled forward. 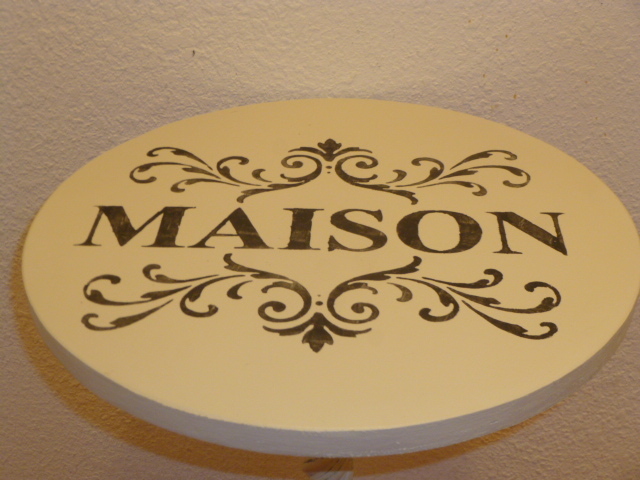 Did you notice the two smaller nesting tables on top of the tallest oval? Once I have more room, I’ll spread those out or stack them for better visibility. I wanted to be sure it was really well stocked going into this weekend because . . . I am occupied taking care of this little ball of energy this weekend while her mommy and daddy (My son and his wife) are out of town for a friend’s wedding. Yep! She follows my every move. Sleeps at my feet when I am sitting down (she’s ON my feet, under the computer desk right now!) And keeps me very entertained. And before you ask . . . she is a ‘Bernedoodle’. So, if stuff site in my booth TOO long without selling, I bring it home and re-make the make-over. Such was the case for this simple little table. THIS ^ was actually it’s THIRD make-over! Originally it was the largest in a set of nesting tables that I bought new 20 years ago. 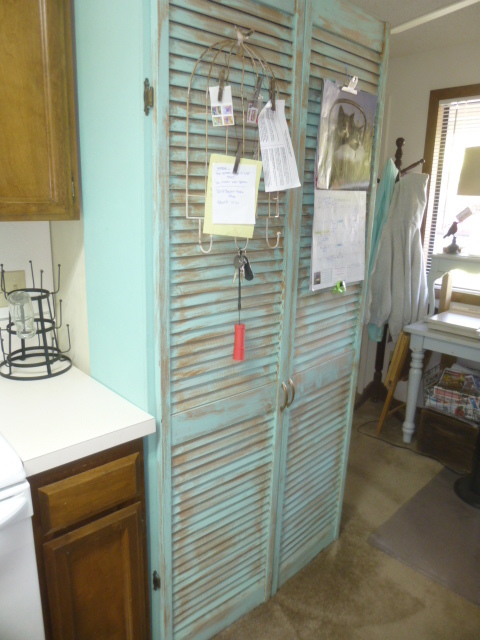 They were primitive/rustic style and I think this one was blue. After a few years I sanded off the blue and stained it hunter green, to match literally EVERYTHING else in my house, which was also hunter. When I’d tired of the hunter green, I changed my decor to Americana with a lot of red,white and blue. At which time I painted the top of this table to look like an American flag. Just before we closed our shop, I had tired of the Americana primitives and sold most of them in an estate sale via the shop. Somehow this little table go left behind, and it has come in handy over the years. In my most recent downsizing though, it HAD to go; at which time I did the above black and tan Paris chic make-over. It has been in my booth for at least 6 months and not sold, so I brought it home and made it over YET again!! But WHAT color do I try next??? I primed the whole thing black and it sat in my garage for quite a while as I pondered my options. Ah-HA!! 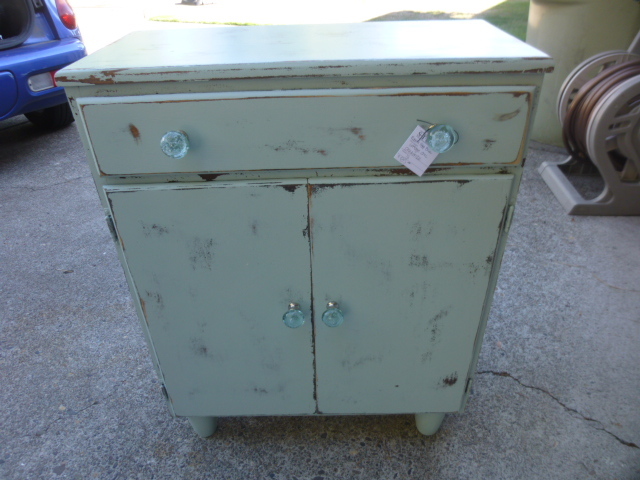 Everything I’ve painted my ‘new lighter blue’ has sold quickly! There’s my sign! And here she is, in her fourth (and hopefully FINAL, incarnation!). 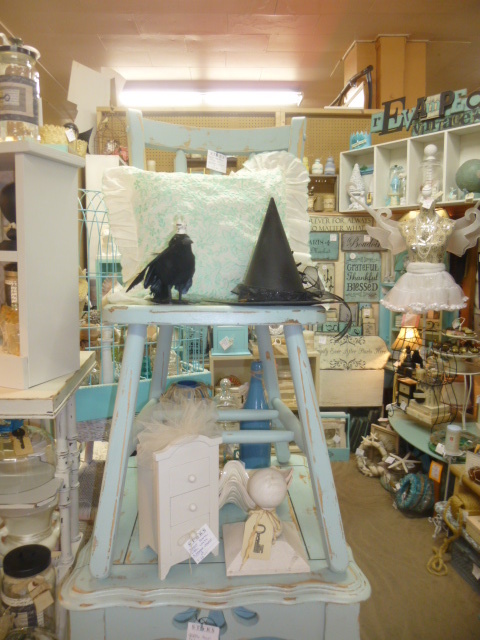 Plain and simple, light Robin’s egg blue over a black base-coat and distressed. I love that, even after so many times being painted and sanded and repainted and sanded again, some of the grain pattern still shows in the distressing! Painted and distressed the legs to match the top this time. Will wait until after Christmas, and possible even until Spring, to take it to my booth at Stars. Just depends upon when I NEED to add more furniture. 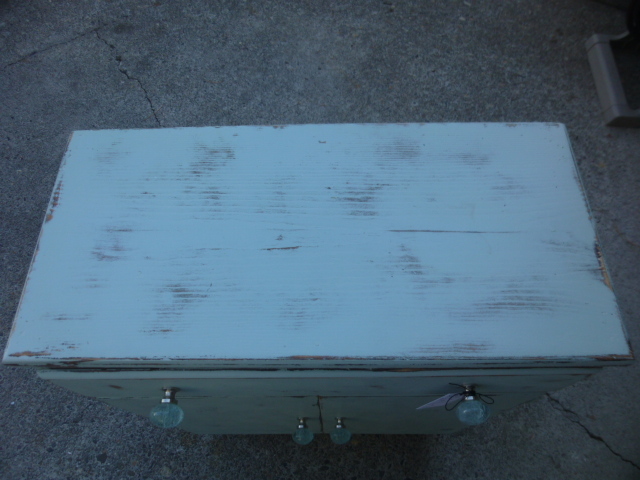 I also painted this chunky wood footstool the same color; but without the black base-coat. 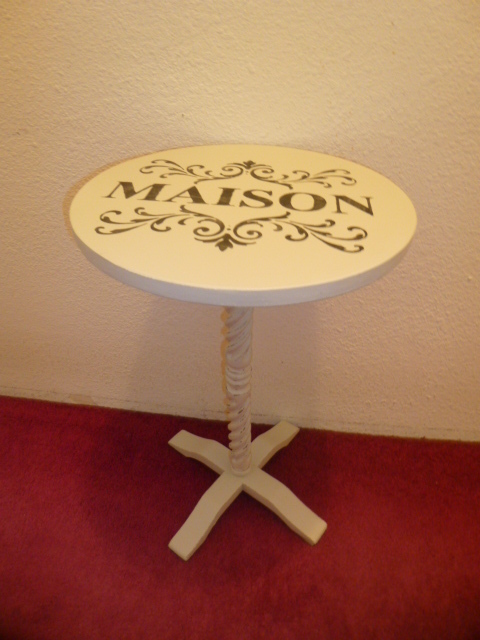 And this cute little stool that already had a coat of white on it. I almost always end up using the little stools that I take to Stars to ‘prop stuff up on’. But they still always sell really well. Ready to go and just ‘waiting for spring’! 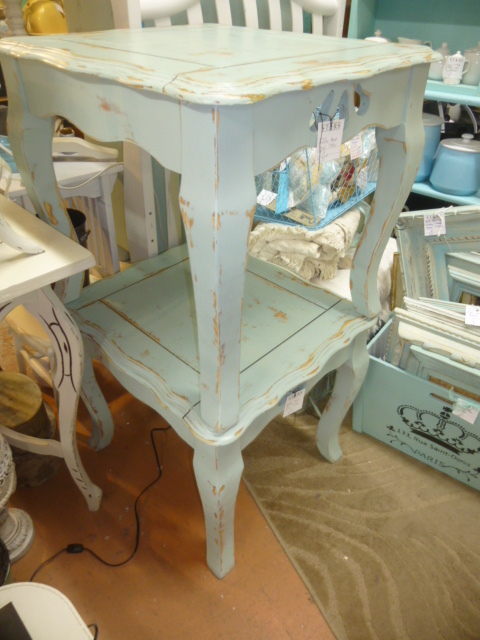 Up next on my ‘paint blue list’ is these two bar stools. . . . IF my son and new daughter-in-law decide they don’t want them. You’ve already seen this piece in the previous post, but here are the details of it. 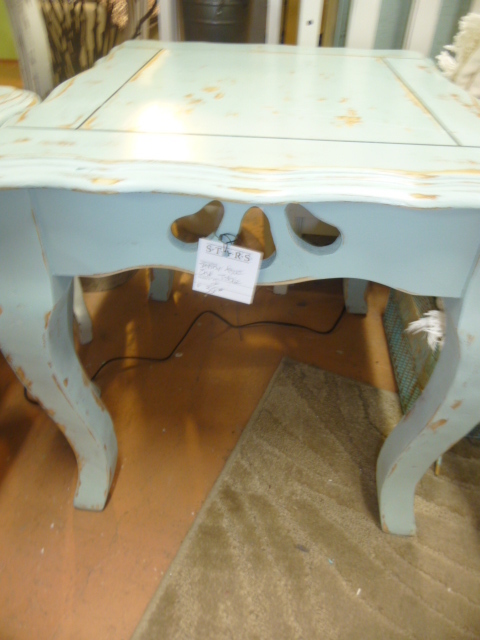 It was originally a plain dark pine stain with round wood knobs and sat flat on the ground. I added some wood feet, because . . . . . I like stuff with feet! 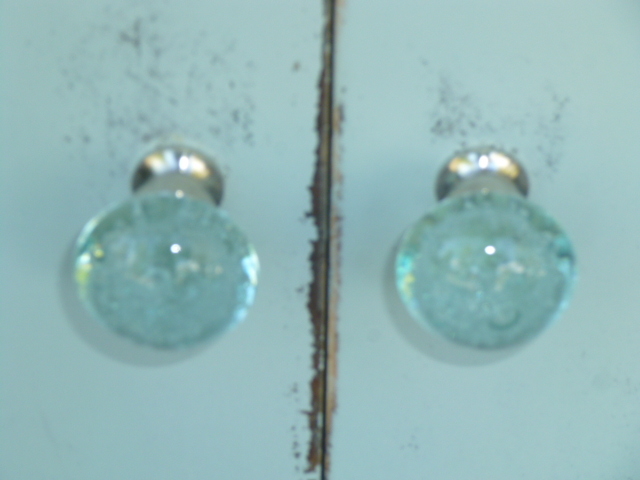 I found these gorgeous bubble glass knobs at Home Goods a while ago. I NEVER go out and buy specific knobs for a specific project. I buy them when I find them at the right price and always have a stash of them to select from. The old original knobs get added to the stash as well. These just happened to have one knob missing; so only five instead of a set of 6 . . . and consequently at a reduced price! 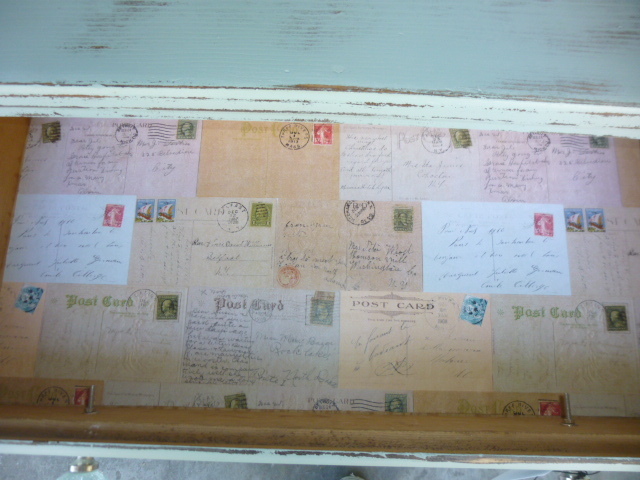 I lined the drawer with some vintage post card wrapping paper. And decided to line the shelves too. I must have made the ‘right choices’ because it sold from my space at Stars in just over a week! 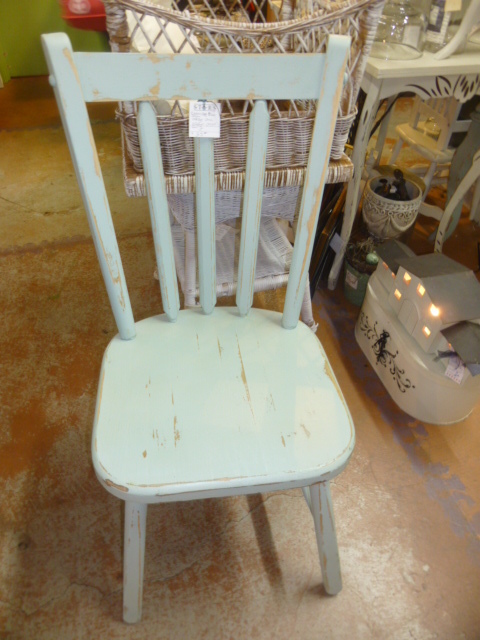 I also painted this old wood chair my ‘new blue’ and distressed it. Here’s what it looked like when I bought it. Gotta LOVE it when you find pieces that don’t need a lot of prep-work’! The chair sold right away also. Painted this pair of end tables with the new blue as well. The tops were pretty badly chipped and scratched, so I did have to sand them quite a bit before I could paint; but the legs were pristine! Love this little cut out detail on the fronts of them. No two pieces will ever distress exactly the same, so don’t even bother trying to get them to perfectly match. 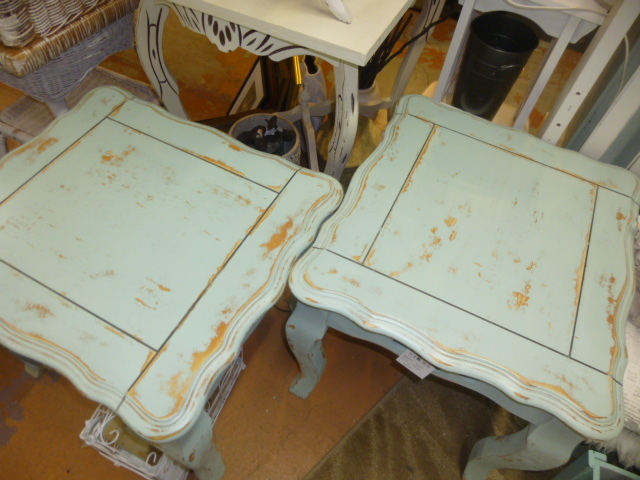 As long as each has a comparable AMOUNT of distressing; they will still look like a ‘matched pair’. I almost always price everything ‘individually’, makes the clerks job much easier and saves them and ME time. Because IF you price items as a ‘set’ you can BET that half the people who look at it will want to know if they can buy just ONE!! Then the clerk has to take time to call me and ask IF I will break up the set and what would the individual prices be . . . . and 9 times out of 10, the customer will NOT buy even one of them!! So, save everyone involved a lot of time and trouble and price items separately. UNLESS you absolutely insist that they be sold as a set. In which case, BE SURE to make a note of that on the price tag. For example I found a pair of matching twin size chenille bed spreads. Chenille is always hard to find and I have NEVER found two that match. So, since this is such a rear find, I want them to be sold together, so the new owners can really enjoy their ‘rare’ vintage find. So, all of these items sold within WEEKS of putting them in my booth. Now I need to find more stuff to paint. 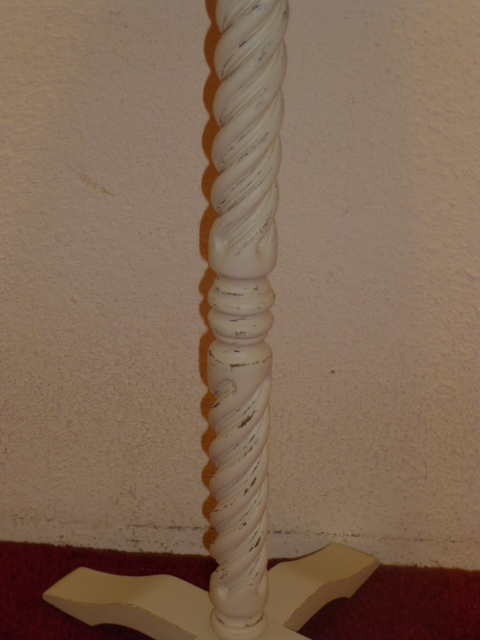 And that ‘might’ involve bringing some of the ‘white stuff’ currently in my booth home to RE-paint! Haven’t been finding much furniture lately on my thrifting adventures. The kitchen and ‘dining room’ in my new place . . .
Well, what is supposed to be the dining room is finally done. AND I actually have some kitchen counter space to work on now! 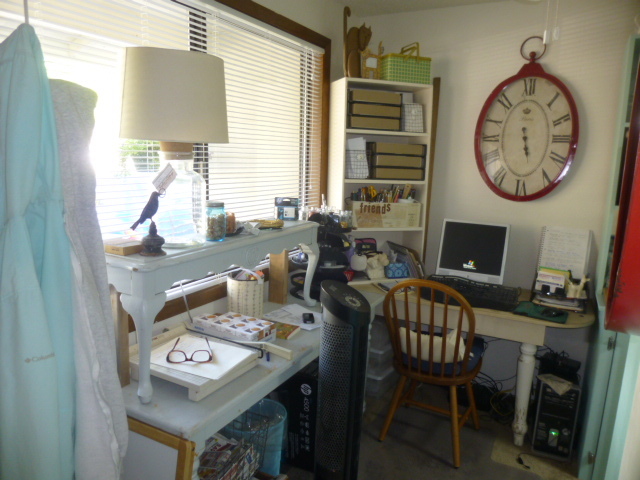 Yep, that IS my ‘dining room’; which is actually my ‘office’. The computer desk and shelf in the corner were in my bedroom at the old place. The tables under the window are old booth displays from Stars; a dining table and coffee table that I cut in half. 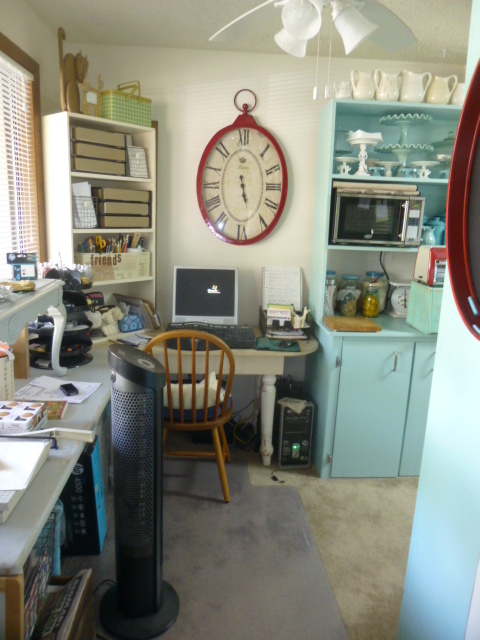 The ‘other halves’ of each piece are in my craft room. The pile of clothes in the far left is actually my coat tree, which is right behind the front door. 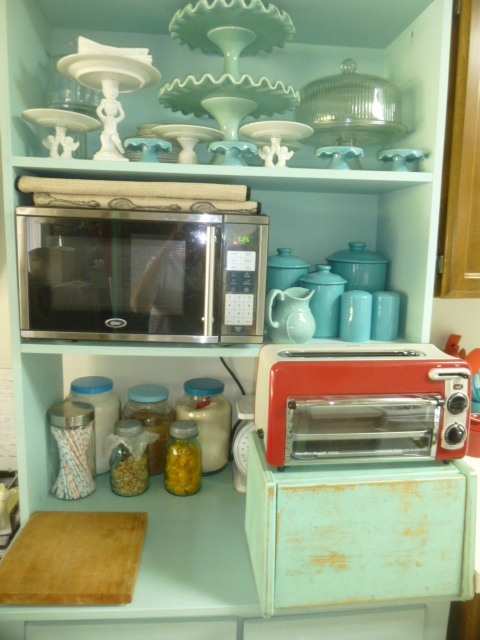 The newly created kitchen counter work space was made possible by adding this aqua step-back cupboard that Michael custom built for me. It was designed as somewhat of an’extension’ of the kitchen. I’m not particularly fond of how I’ve got the toaster on top of the bread box, but for the sake of counter space and lack of cupboard space, it’s a necessity. Before Michael built the cupboard for me, ALL my kitchen counter space was taken up from the microwave, toaster and bread box. I had that small white shelf in this spot with my canisters on it. My cake stand collection was on one of the shelves in the living room. My ‘secondary’ collection for ironstone pitchers is on the top of the step-back. These are the unique ones that don’t match the rest of my collection; which is on a shelf in the living room still. And this is the kitchen. Cozy, eh?? 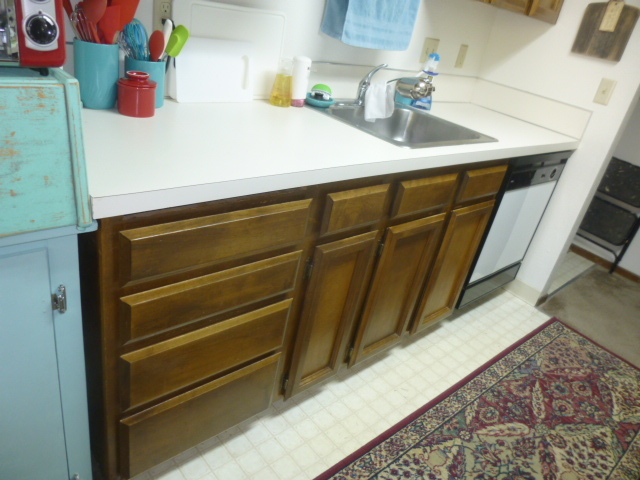 The left of the sink here is where the microwave and toaster were before, and the newly created counter work space, which is slightly bigger than the space to the right of the sink. LOVE my red butter bell!!! I have never seen them in colors like this, so I had to keep this one. I stock and sell a lot of these in my booth at Stars, but they are always white; occasionally I find them with thin blue stripes around the rim. 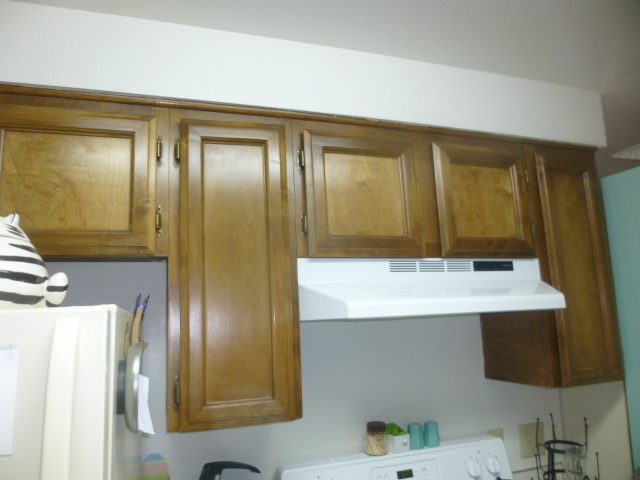 These are the cupboards above the sink side of the kitchen, and these two little cupboards are the only space I have for pantry food storage. I painted this thrifted wire shelf white to store my dish towels and cloths on; as there was no drawer or cupboard space for them. 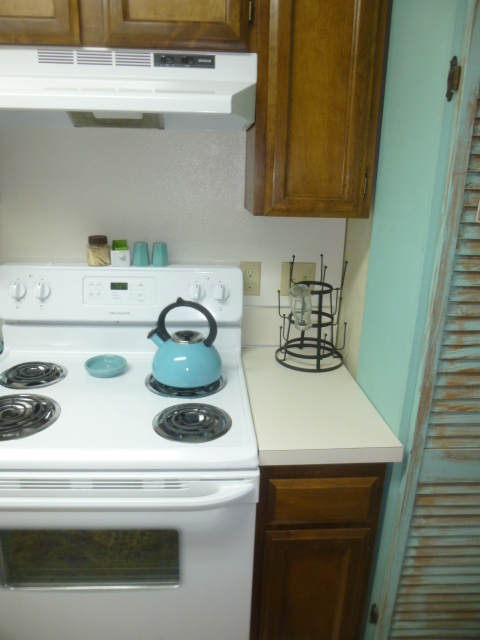 Two very narrow cupboards on either side of the stove for baking pans. 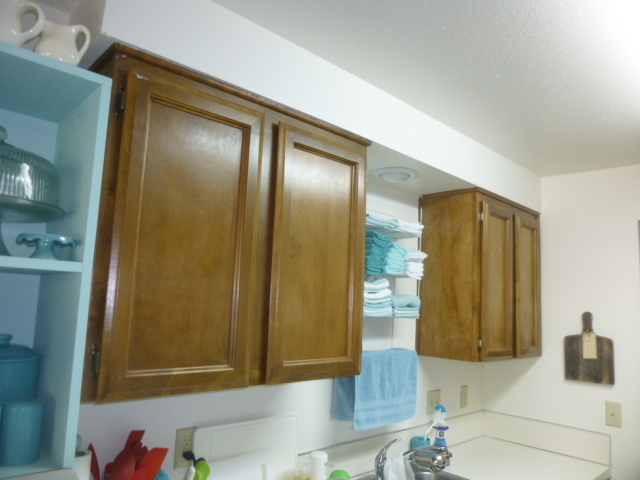 Two more very narrow cupboards above the stove for spices, oils, coffee, etc. 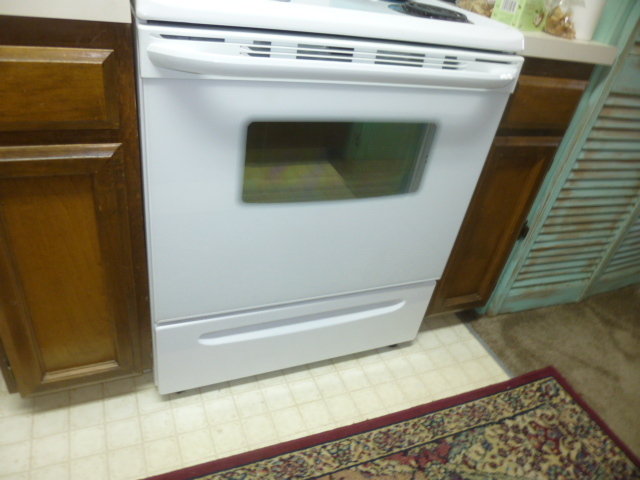 Counter space to the right of the stove. 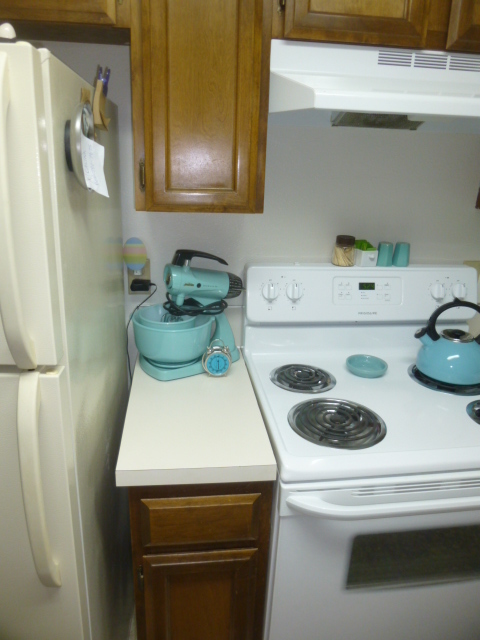 And to the left of the stove, just enough room to display my prized vintage turquoise Kitchen Aid mixer. 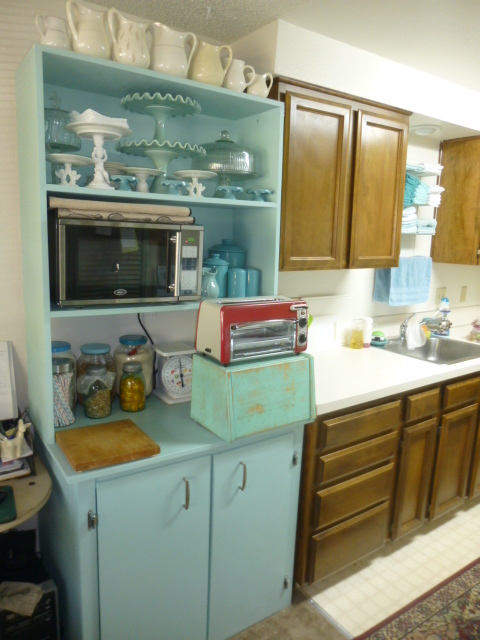 Soooooooooooooo . . . . .two cupboards above the sink for food, two small ones above the stove for spices etc; drawers for silverware, utensils, skillets, plastic wrap and foil, oven mitts and vitamins; two cupboards beside the stove for pans . . . . . .and that fills ALL the built in kitchen cupboards!! WHERE do I put my dishes?!?!?! 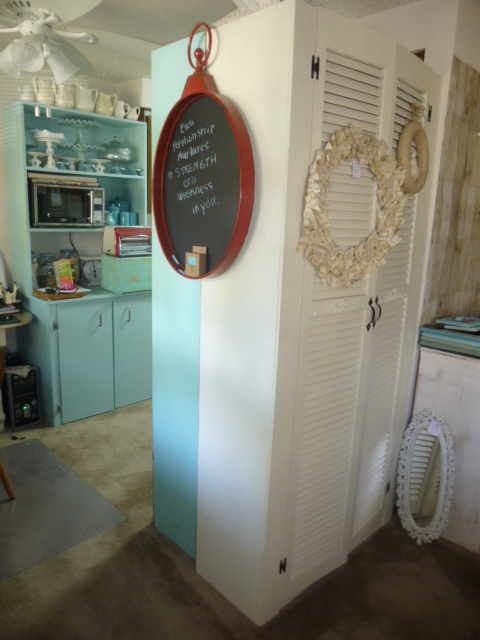 I was actually prepared for this dilemma in advance and placed my two big shutter cupboards ‘back to back’ at the entry space to the dining room; dividing the kitchen and living room. The white one faces the living room and is used for ‘office stuff’. 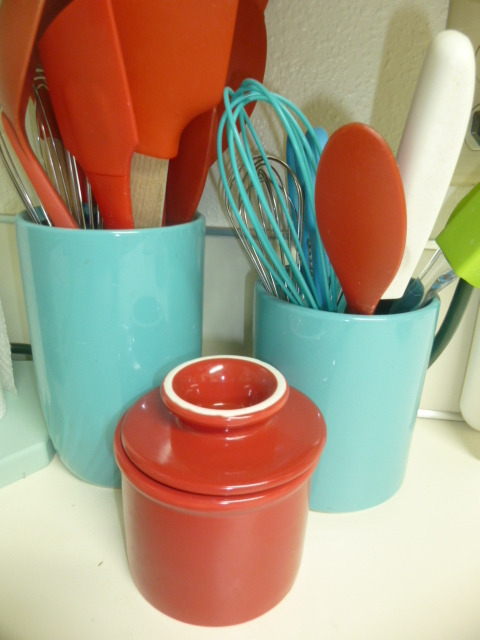 The turquoise one faces the kitchen, on the right of the stove and stores my dishes. I have a LOT of dishes! 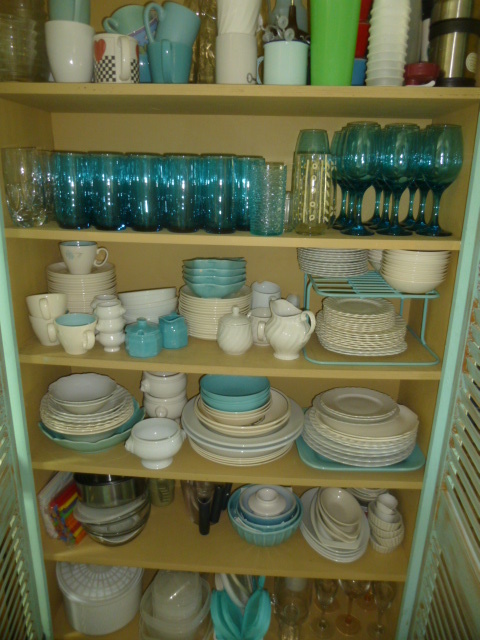 Most of the dishes are thrift finds; and I kind of had collections of three different sets started. 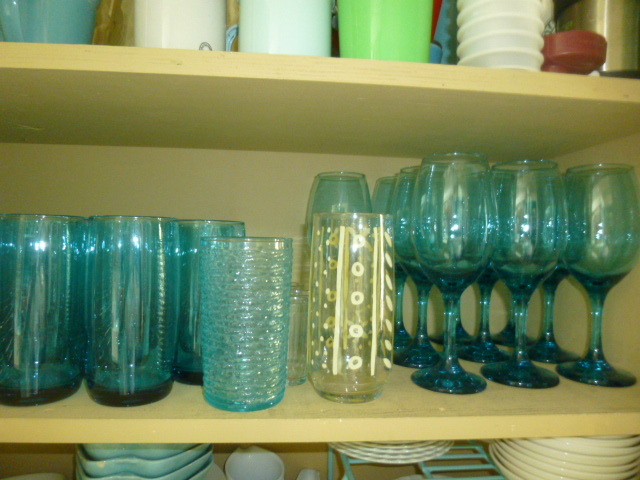 The turquoise glasses and wine glasses I found at Dollar Tree!! 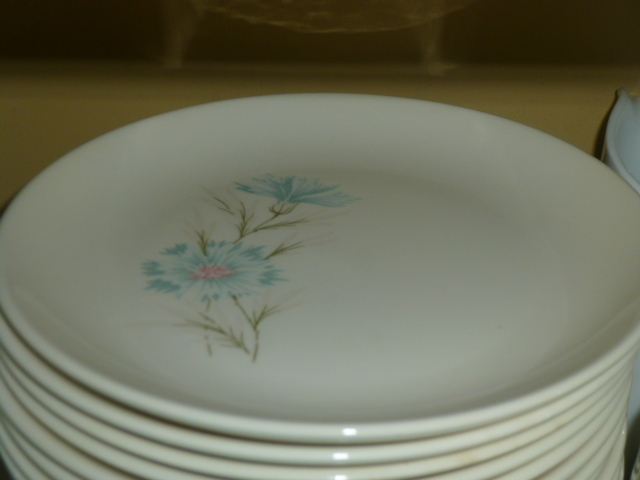 The first style I started collecting are these, and I was hoping to find enough of all pieces to make them the dishes I use all the time. Alas, they have been harder to find than I had hoped. But these vintage Johnson Bros. English Ironstone dishes that I had also started collecting also have become easier to find. So now I am working on making these my regular dishes. A few assorted ‘odd balls’, just because I like them; like these lion’s head ramekins that match some soup lion’s head soup bowls; some vintage and some found new at Ross. 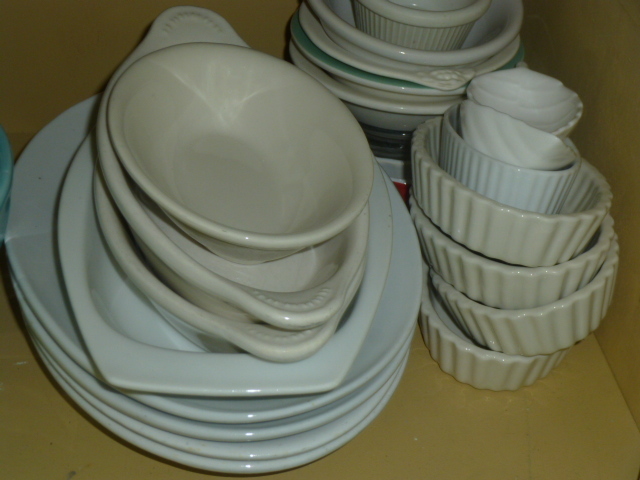 Some vintage oval platters and boats; and more vintage ramekins. And that’s the kitchen and ‘dining room’ in my new place.